Or about the population of Cyprus. 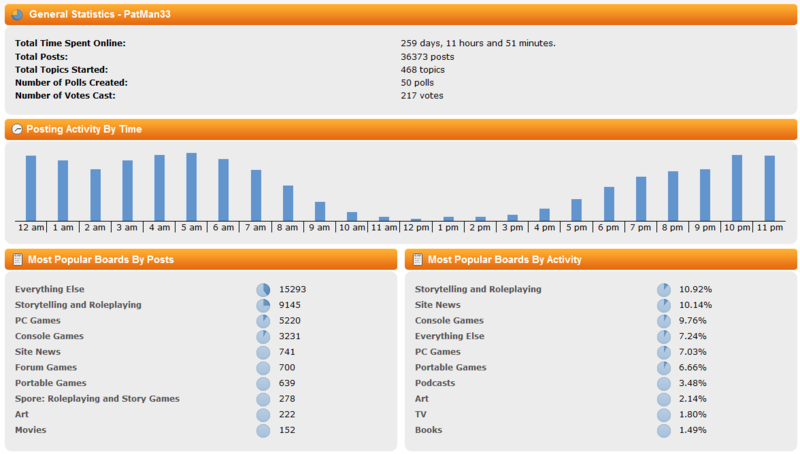 Was looking around at my posting stats and noticed my posting times have more or less flipped. Used to be all in the afternoon but now they're at every time except the afternoon. There was also a time when I (being crazy) forced myself to post at 4 and 5 am in order to have some stats in those columns. Guess I went overboard. Also noteworthy (to me) is that my average number of posts per day is currently 11.879, which is down from a high of ~17. Guess that reflects the slowdown of the board and the uptake of other things in my life. It took about two years for that average to come down though from my peak posting phase. My peak posting period was in 2005. I was averaging 24 posts a day. It's now only 2.233. My peak posting average was around 2 posts a day. Now it's telling me I'm at 1 post a day. I remember when I was posting almost 10 posts each day. I'm now only here every couple of days don't get as much time as I used to. I miss you a lot, Cobra. Dude's married, he's got better things to do with his time. Second off: I'm gonna compare charts because I just saw that there.